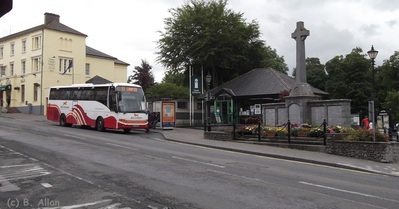 This page has info on timetables, fares, Cahir railway station and bus stops. The station is unstaffed, has a shelter with bench seat and open-air platform seating. Access to the station is via the ramp shown in the photo (left). The station has one platform in use (the second platform is devoid of track and out of bounds). The station is around a five minute walk from the town centre. The document below details rail & sea options from Cahir to Britain via Dublin-Holyhead. 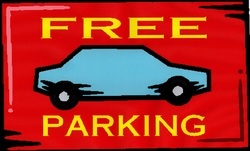 Please click here to visit this website's page about travelling by sea & rail from Rosslare. 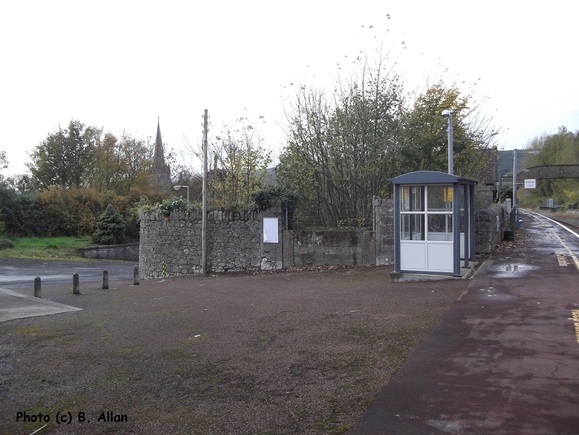 Bus Éireann Expressway route 55 which serves Bansha departs from the stop outside the seasonal tourist office as shown. 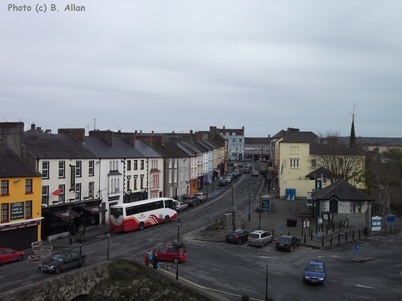 Bus Éireann Expressway route X8 which serves Cashel departs from the stop across the road from the tourist office on Castle Street as shown in the photo on the left.